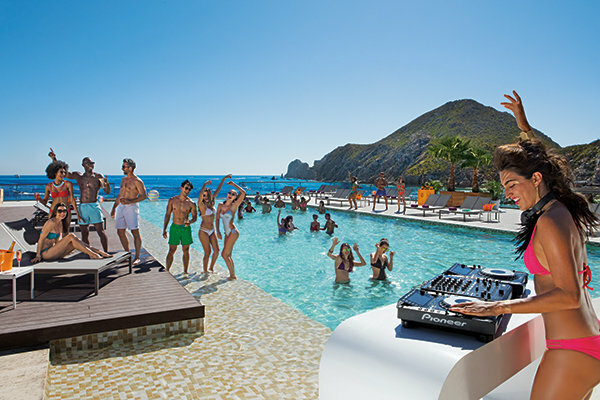 Plan the ultimate bachelorette getaway at Breathless Cabo San Lucas Resort & Spa! Think outside the box. Instead of being the 10th person in your group of girlfriends to celebrate in Las Vegas, suggest someplace exotic and sunny—Cabo San Lucas, Mexico. All of your girls can add a new stamp to their passport and earn instant bragging rights for best bachelorette party ever! Breathless Cabo San Lucas Resort & Spa is stunningly situated in the heart of Cabo San Lucas, only minutes from the excitement and nightlife of the city, on beautiful Medano Beach, one of the best swimmable beaches in the area. The costs are all known upfront; once on property, leave your wallet behind knowing you won’t need it! Thanks to the Unlimited-Luxury® experience, where everything is included, your girlfriends won’t have to worry about how much each dinner costs or ordering another round of drinks. Indulge and enjoy! It’s all here! You never have to leave resort property to experience night life. The parties and entertainment at Breathless Cabo San Lucas will amuse, surprise and arouse your senses. With an impressive weekly calendar of events and unique monthly themes, there is around-the clock fun to be had. Whether you wake up early or sleep in, treat yourself to breakfast in bed in one of the ultra-contemporary suites, compliments of 24-hour room service. Relax on your terrace, boasting marina or ocean views, and take advantage of the mini bar that is refreshed daily! Relax and indulge. Feel free to continue indulging without worrying if you'll fit in your dress. From daily yoga, kickboxing, and Zumba classes to water aerobics and a 24-hour fitness center, there are exercise activities for everyone. Meet new friends or participate with your girls as a fun group activity! Rejuvenate at the relaxing Spa by Pevonia®, where a bevy of sumptuous treatments stimulate your senses. Upgrade to the Last Fling Before the Ring package and have a spa day for you and your ladies! It includes a mani/pedi, massage, and access to the hydrotherapy circuit and relaxation areas. Melt away any wedding stress. There’s something for everyone. For your girls looking to relax and tan, there’s a beautiful swimmable beach. The more adventurous can test their skills at watersports, mixology classes, and more! Or combine activities for a happy medium of relaxation and excitement. Everyone will be thrilled with this getaway! Breathless Cabo San Lucas is adults-only, not "couples-only". A kid-free zone is a must for the perfect bachelorette party, but it is equally as nice not to be surrounded by honeymooners. Mix and mingle with other guests to create lasting friendships—and maybe more for your single girlfriends! Savor scrumptious and succulent international cuisine with seven different dining options. Dine exclusively with your girlfriends or branch out at the communal tables located at select restaurants—you never know who you’ll meet! Any restaurant is sure to please with gourmet menus prepared by expert chefs. Make the most of the bachelorette getaway by having it lead up to your Destination Wedding! Expert wedding coordinators are ready to guide you through every step of the process to create the day you envision. Go from having an amazing bachelorette party to a breathtaking wedding, all at Breathless Cabo San Lucas Resort & Spa.